In February, Marvel introduced its newest Filipina superhero, Wave, described as a "mysterious new Filipina heroine." The latest addition to the Marvel Universe screams badass Pinay. Wave totally rocks her black, green, and gold ensemble, wielding not one, but two swords. The artist behind the stunning artwork is Mico Suayan, a Filipino artist. He's worked with various companies producing comics such as DC, Valiant, and Marvel. 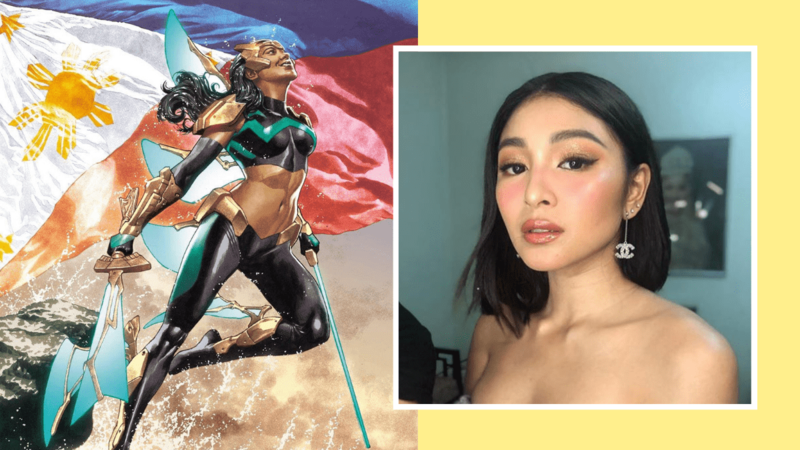 Today on social media, Mico revealed his inspiration behind morena-skinned Wave: Nadine Lustre, to the glee of both comic book fans everywhere and the actress' followers. The illustration will be gracing the covers of War of the Realms: New Agents of Atlas #1. Mico credited Rain Beredo, who colored the cover, as well as co-creator and designer Leinil Yu, and Comic Odyssey honcho, Sandy Sansolis. The story is set in Asia, where Wave joins fellow Asian superheroes like Korean-Americans Silk and Amadeus Cho, Chinese Shang-Chi, and SHIELD agent Jimmy Woo. They band together to fight dark elves terrorizing Earth. Comic book store Comic Odyssey will soon start accepting pre-orders for the limited edition cover ofWar of the Realms: New Agents of Atlas #1, which will be released in May. We can't wait to discover what Wave's unique powers are!